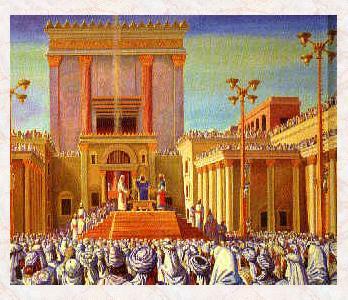 The Third Holy Temple will be greater than the First and Second Temples, for they both were temporary; the Third Temple will be built by the Messiah and will be eternal. Righteous Gentiles who observe the 7 Noahide Commandments receive Divine blessings and attach to the Shechina in this world and the next. They are “under the wings of the Shechina” – the Divine Presence. The prohibitions of idolatry and blasphemy include any assumptions of there being self-contained beings or forces that are not totally dependent on God and His Providence. Righteous Gentiles who follow the 7 Laws of Noah merit great reward, and many are anxious to start on this path. There are 7 kabbalistic spiritual powers (as reflected in the seven weeks between Passover and Shavuot) which are manifested in the emotions in the human soul, and in the emotional modes of investment of G-d’s Shechinah (Divine Presence) into the heavenly realms. Chassid insights for understanding the “higher level Unity” and the “lower level Unity” of G-d (at least in a small way). Chassidic teachings say that G-d made the creation with 6 of His 10 Divine attributes: the midos or sefiros from Chesed (Kindness) to Yesod (Foundation). This lecture gives more details of G-d’s creative process. Chassidic meditation uses the mind through study of Chassidic teachings to serve G-d and bring Him into revelation in the world through unifying [one’s conception of Him], knowing Him through His works, and loving Him through an intellectual understanding of His greatness.